(1) 道奥康治，水温成層と熱循環が水質に及ぼす影響，「湖沼、貯水池の管理に向けた富栄養化現象に関する学術研究のとりまとめ」, 土木学会水理委員会・環境水理部会, (2000), pp.303-400. (2) Thompson, R. O. R. Y. and Imberger, J., Response of a numerical model of a stratified lake to wind stress, In Second Intl Symp. Stratified Flows (ed. T. Carstens & T. McClimans), Trondheim, Norway, (1980), pp. 562-570. 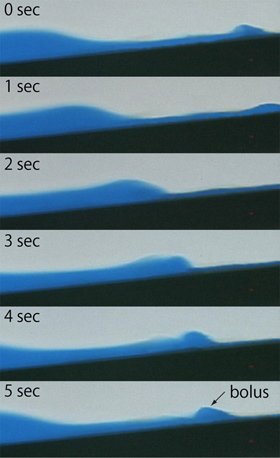 (5) Helfrich, K. R., Internal solitary wave breaking and run-up on a uniform slope. Journal of Fluid Mechanics, Vol.243, (1992), pp.133-154. (6) Shimizu, K., and Imberger, J., Energetics and damping of basin-scale internal waves in a strongly stratified lake, Limnol. Oceanogr., Vol.53, (2008), No.4, pp.1574-1588. (7) Fringer, O. 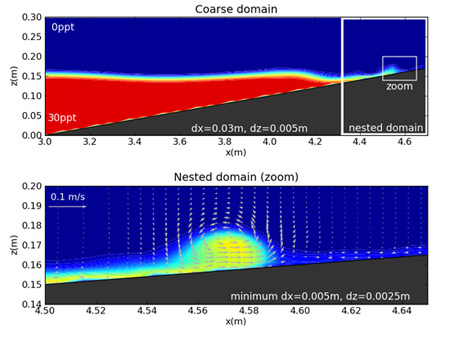 B., Towards nonhydrostatic ocean modeling with large-eddy simulation, Oceanography 2025, (2009), pp.81-83.